Happy Hump Day! 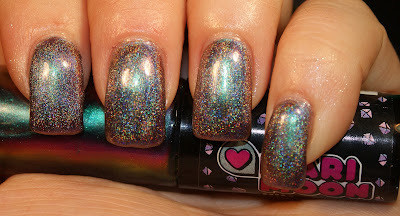 Hump Day Holo has returned once again, but this time, we're going to holo-fy a color for you. It's a little throwback! 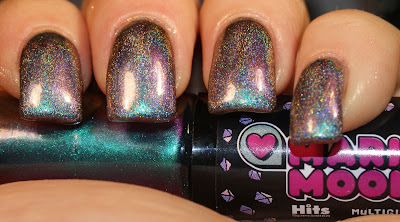 I'm bringing you HITS Mari Moon Cutie Pie, which is normally a blue-purple-magneta duochrome. 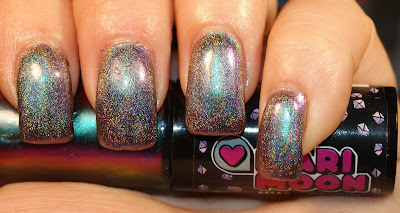 And with a little help from OPI DS Shimmer, I have turned into sparkly holo goodness! Here, you can see the MAJOR POP the OPI DS Shimmer added to the color! And even here, you can tell the shift in color. This one, lastly, shows just how much duochrome the DS Shimmer pulled out. It's not nearly as much as the original polish, but it's still a gorgeous shift nonetheless! So what do you think? Would you rock a holo-fied Mari Moon Cutie Pie? omg drooling... you captured the color shift very well!! !